Carrying power plugs - especially Britain's big ones - can be the bugbear of any gadget-laden traveller. But one designer may have come up with a solution: a folding plug. Although still just a prototype, designer Min Kyo Choi has essentially rewired a traditional UK three-pin plug measuring roughly 48 x 44 x 46mm into a flat-pack design that's just 48 x 44 x 10mm. By fixing the live and neutral pins onto a twisting body, both can be rotated from a horizontal to vertical position so that they sit underneath the plug’s earth pin. 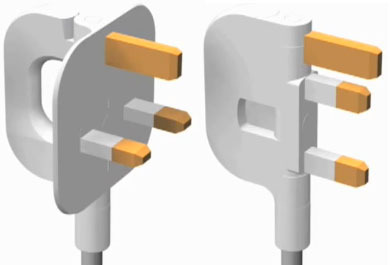 At the same time, the plug’s body can be folded closed like a book – reducing much of its bulk. When it comes to slotting the plug into an outlet, the process is as simple as twisting the two bottom pins into the horizontal position and opening up the two flaps. In between the flaps there’s a finger slot for pulling the plug out of the socket once you’re done. This section also contains the plug’s fuse – shown in red in the video.